You can download the e-book as soon as your purchase is completed. All relevant STL files are free of charge, see links below. This build is for all of you who just want to fiddle around and conduct experiments with gas turbines in a simple and affordable manner. Given that you either own or have access to a good quality hobby 3D-printer the build itself is a low cost project, especially when considering that the final result is a real functioning jet engine. 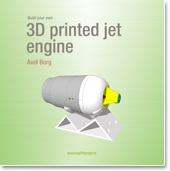 Running and disassembly of 3D printed jet engine. 3D-printed jet engine "The Hair Fryer". 3D-printed jet engine "endurance" and temperature test. 3D printed jet engine 15 min run.